sites-of-memory.de Tallinn memorial to the sunken "Estonia"
These pictures were taken on 27 June, 2006 near the harbor in Tallinn. 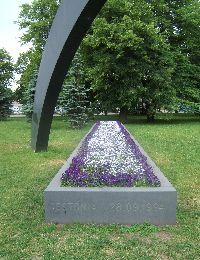 It is a memorial to the passenger ferry Estonia that sank in 1994 en route from Tallinn to Stockholm. This is the view from the town side, near the Maritime Museum, overlooking the harbor. The plaque lists the names of the dead. 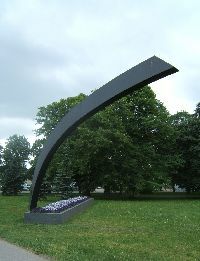 The last pictures show the lower of the two arc pieces, a view from below, looking back at the city of Tallinn. 28 September, 1994 was the date of the sinking.